Thailand’s second largest island, Koh Samui, attracts the most diverse groups of visitors of all the Thai islands. Visitors book the four and five star hotels, relaxing on the fabulous beaches, and making use of the top quality restaurants and spa facilities. With its excellent island transport links, it is also a favourite stop-over for the island-hoppers who arrive, wishing to spend their two or three weeks’ vacation visiting as many of the islands as possible. 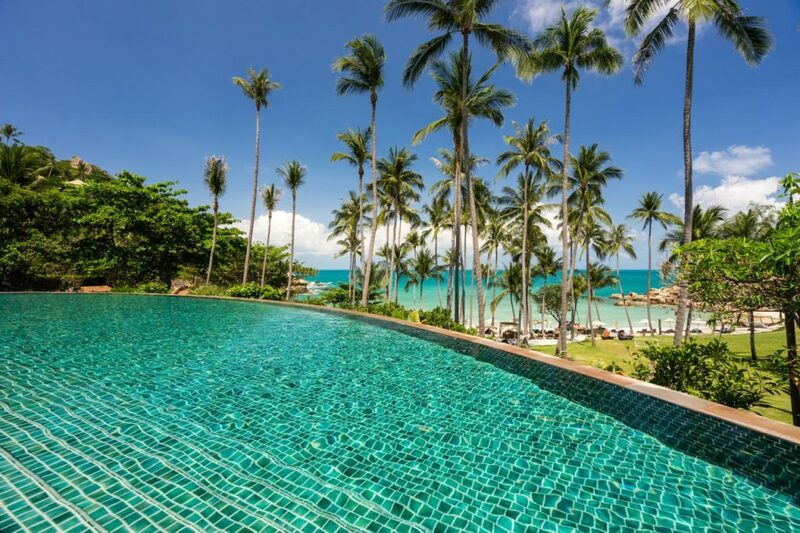 To give you an idea of what this tropical paradise has to offer, here is a small selection of some of the best hotels on Koh Samui. Heading To Phuket? Read our guide to the best Luxury Phuket hotels. 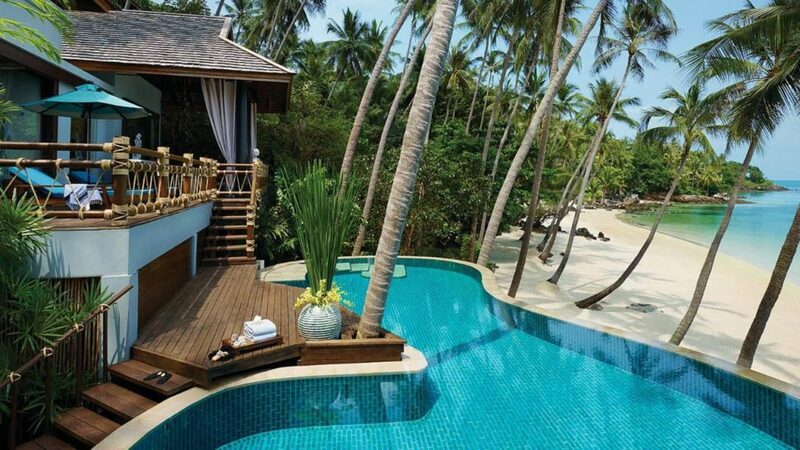 The Banyan Tree Samui resort nestles on the edge of the Lamai jungle. 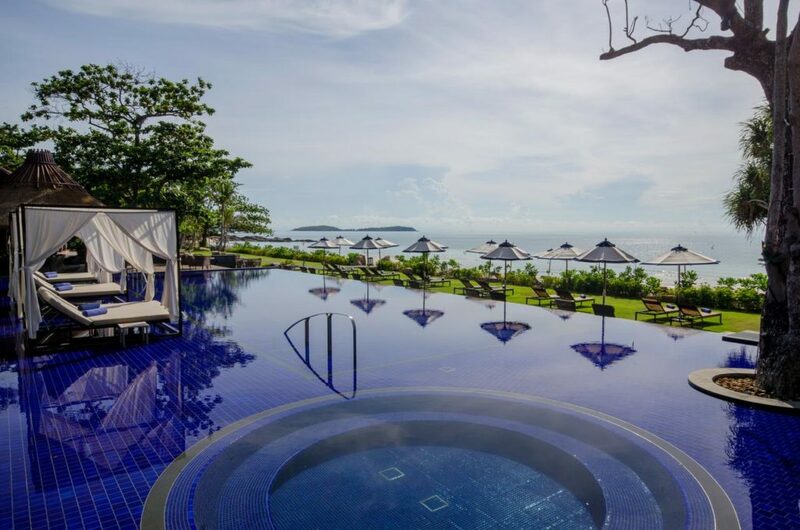 From its secluded position overlooking the Gulf of Thailand this plush five star, 88 room complex whispers tranquillity as soon as you arrive at the entrance. With its private beach, three restaurants, three lounges, indoor and outdoor pools, top quality spa, wellness and fitness centres with personal service, you won’t need to leave the complex. But, if you want to explore more of this idyllic island, water and road shuttle transport is readily available. Just 10 miles from the airport, the Belmond Napasai five star hotel complex lies snuggled amongst the palms that border its picturesque private beach. With 24 suites, 45 villas and a raft of different things to do, it is an ideal venue for a family holiday. Activities include an attractive infinity pool, children’s pool, spa and wellness treatments, tennis courts, and a variety of water sports, boat trips, golf, and elephant excursions. With qualified dive instructors on hand, the whole family can sign up for diving or snorkelling lessons – or just lay back, unwind, and enjoy the tranquil atmosphere of the Belmond Napasai. 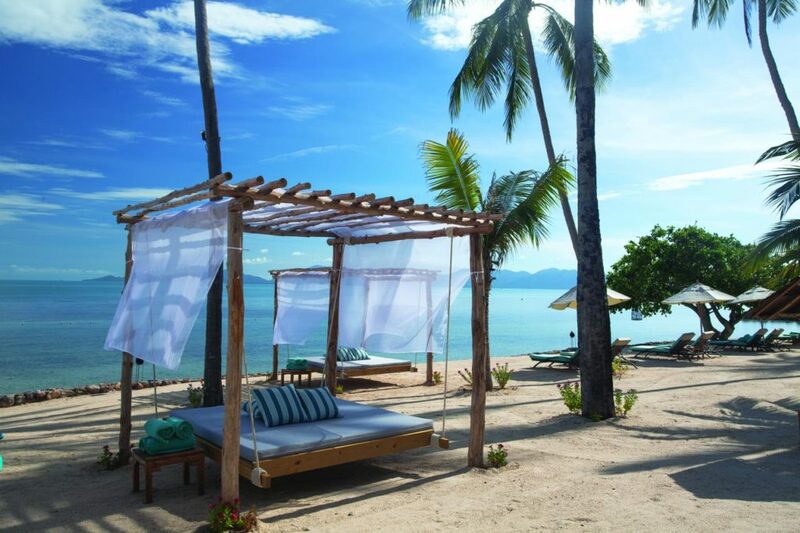 Situated just a 30 minute drive from the international airport, and the same distance from Big Buddha, Four Seasons lies on the northwest tip of Koh Samui, at Laem Yai Bay. One of the most popular destinations on the island for those seeking an away from it all romantic, special occasion, or peaceful break. Four Season’s staff have built themselves quite an international reputation for the very best of personal service. Add to that the splendour of their 60 detached villas, picture postcard surroundings, gourmet cuisine, and very large range of available activities, and you have the perfect recipe for complete holiday indulgence. If you like to get absorbed in the history and culture of your holiday destination, then a stay at the Ammataru Pura Pool Villa complex on the edge of Lamai Beach should fit the bill. The whole complex is traditionally styled, with much use made of dark Thai wood, intricately carved trees, statues, and religious deities. 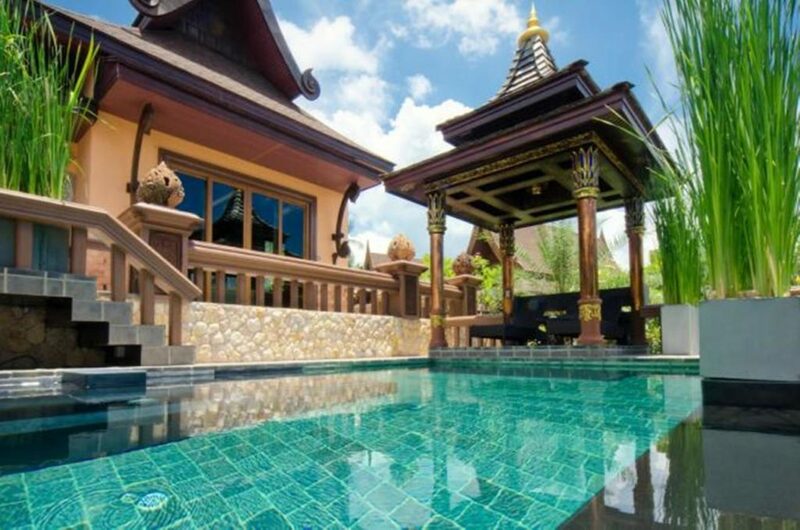 The beautiful villas also embrace traditional building techniques with timber beams, cool tiles, and heavy, period style furniture. The restaurant offers Asian and International cuisine and vegetarian and vegan options. With sauna, spa and fitness centre, you can be as active, or as laid-back, as you like. 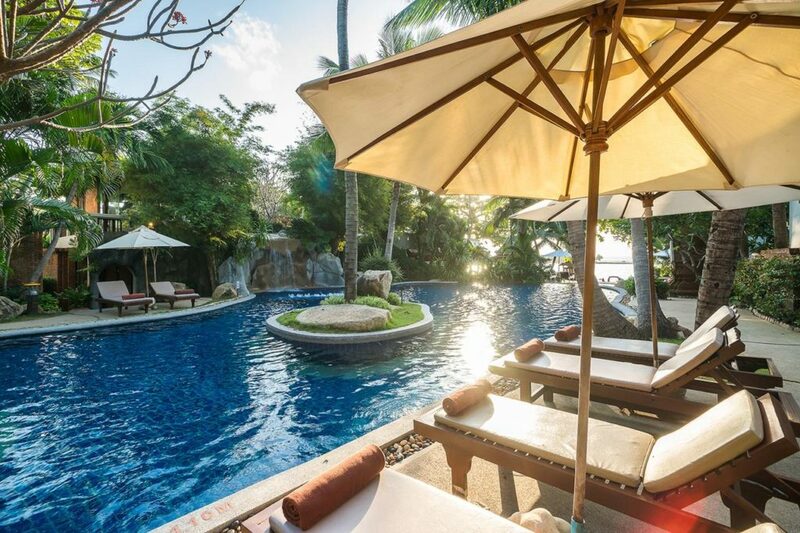 A fifteen minute drive from the airport will get you to the stunning beach area of Choweng Noi, and the 80 suites and villas of the luxurious Vana Belle resort. Lying back off the beach, amid swaying palm trees and tropical vegetation, the Vana Belle offers a tranquil, quiet location from which you can explore the surrounding area. Or, if you prefer, just soak up the relaxing atmosphere with a good book, interspersed with visits to the spa, wellness and fitness centres. Restaurant facilities are limited, with Panali, the shore side eatery serving Italian cuisine, and the hillside Kiree restaurant, concentrating on traditional Thai food. 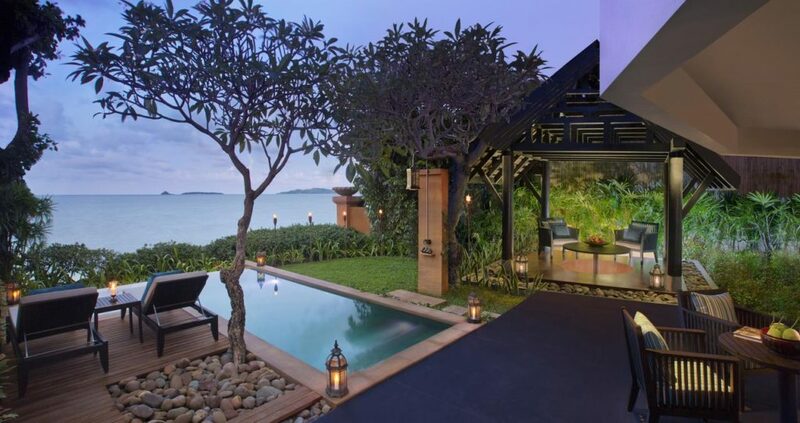 The hillside location of this luxury resort allows the most stunning views over the Gulf of Thailand. Just 15 minutes from the airport, Silavadee means ‘beautiful rock’ in Thai, and refers to the pristine, private beach just a few minutes’ stroll from the resort. 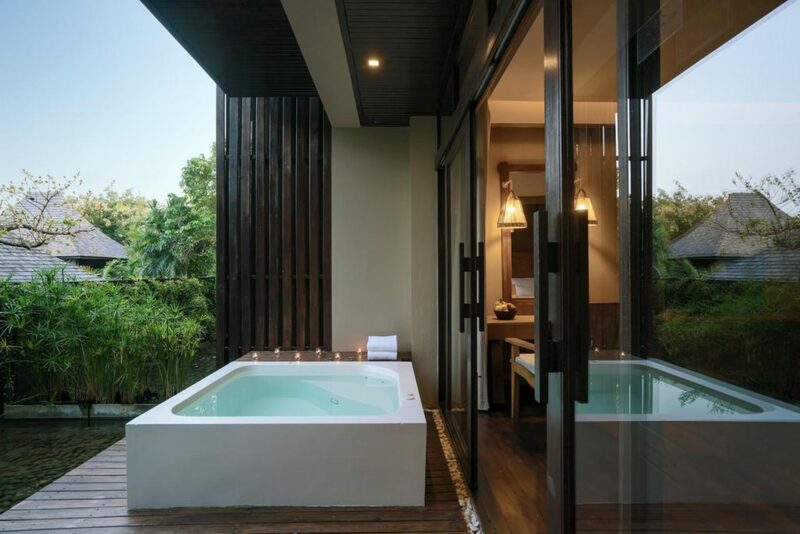 The 44 villas and 36 rooms are decorated with modern Thai furniture and fabrics. Whether relaxing around the pool, eating in the hillside restaurant, or enjoying a cocktail on the rooftop terrace, the stunning views across the bay will provide memories to last a lifetime. Muang Samui is on the east coast of the island, and just ten minutes by car from Koh Samui’s airport, or 15 miles from Nathon City if arriving by ferry. A boutique complex, the resort has 53 suites, all with terraces and views out to sea or across the tropical gardens. Comfortable rooms are decorated in typical Thai style and have all the usual facilities. The two restaurants serve Italian, international, or traditional Thai cuisine. Spend your time unwinding around the pool or on the beach, before jumping into your hire car to explore further afield. If you enjoy trying a little of everything when on holiday, the Anantara Bophut Resort is ideally placed for you to do just that. Popular with both couples and families, in-house facilities are excellent. Rooms, although not as large as some, are tastefully decorated, and seamlessly blend traditional with contemporary. Of its three excellent restaurants, the Full Moon Samui is the piece-de-resistance with its many seafood, international, and Thai speciality dishes. Amongst its many facilities, the exceptional spa and wellness centre is an experience not to be missed. Add to that being next door to the Fisherman’s Wharf at Bo Phut, and a short taxi ride from Chaweng’s bustling night life, and the Anantara Bophut Resort can provide all you require.